Economically Weaker Sections (EWS) is a new 10% reservation quota in direct recruitment in civil posts and services in the Government of India. 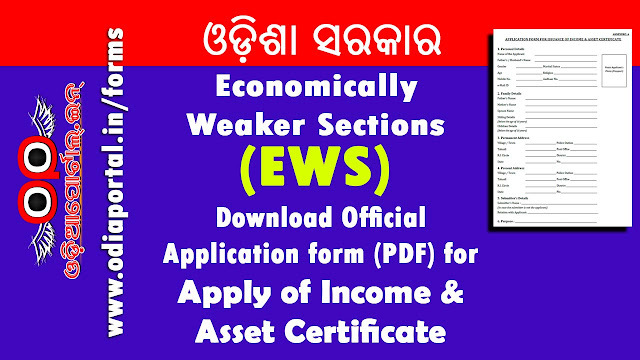 In Odisha state, you must apply for EWS certificate. We have uploaded official Application for as per Revenue and Disaster Management Department, Govt. of Odisha vide letter no. 9208 dt. 18/03/2019. About EWS: The persons belonging to EWSs who, are not covered under the scheme of reservation for SCs, STs and OBCs shall get 10% reservation in direct recruitment in civil posts and services in the Government of India. Persons who are not covered under the scheme of reservation for SCs, STs and OBCs and whose family has gross annual income below Rs 8 lakh (Rupees eight lakh only) are to be identified as EWSs for benefit of reservation. Income shall also include income from all sources i.e. salary, agriculture, business, profession, etc. for the financial year prior to the year of application. Who Will Issue the Certificate in Odisha ? (i) District Magistrate/Additional District Magistrate/ Collector/ Deputy Commissioner/Additional' Deputy Commissioner/ 1st Class Stipendary Magistrate/ Sub-Divisional Magistrate/ Taluka Magistrate/ Executive Magistrate/ Extra Assistant Commissioner. 1. 3 Rs Court Fee Stamp. 3. Form Printing Charges Extra. 1. Fill Annexure-A Form, and Submit at your Tahasil along with fees.